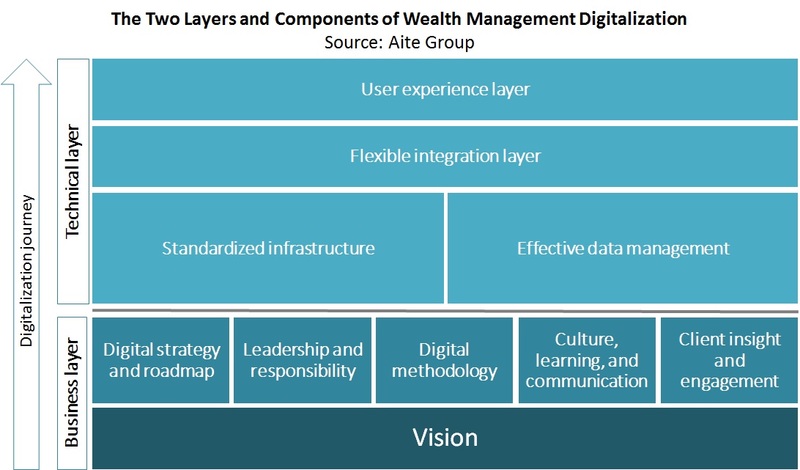 Wealth managers actively seek engagement with solution providers that can support their journey to digitalize. London, 7 July 2016 – The technologies available to wealth management firms across the world have advanced at a significant pace in the last five years. These solutions are built specifically for wealth managers rather than adapted to them, a critical distinction that signals the sector’s evolution as well as technology’s increasingly central role. Will wealth managers’ gradual acceptance of digitalization’s significant role in their operational models transform the business? This report is based on 2015 and 2016 discussions with and requests for information from 12 digital enablers headquartered in either Europe or Asia. These businesses offer a toolkit to support the traditional wealth management sector in delivering new and enhanced solutions to their internal and external audiences, and they include Adviscent, Alphametry, Apprecie, Call Levels, Capitalise, DSwiss, Finhorizon, Invstr, Mydesq, Qumram, Trusted Family, and WealthObjects. This 46-page Impact Report contains 22 figures and 20 tables. Clients of Aite Group’s Wealth Management service can download this report. Digital Investing: Collaborate or Call a Sherpa?